These are brief descriptions of some of the bands which I list and/or represent. They don't pay me, they are just friends - and I don't guarantee the descriptions are complete, or up to date, or even correct.... but they give an idea of who's who. THE NASHVILLE TEENS Original Sixties Band famed for Tobacco Road, Google Eye, and This Little Bird. Five piece hard driving R&B band. The original vocalist, Ray Phillips, is one of the best R&B vocalists in the Country and still leads the band. 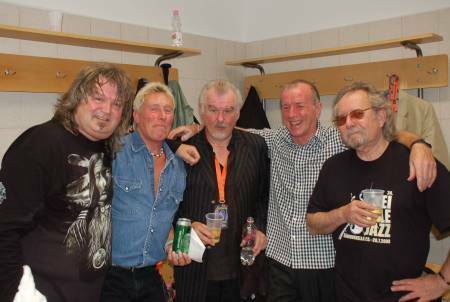 The other musicians are Colin Pattenden (bass guitar), Colin was a founder member of Manfred Mann's Earth Band ; Adrian Metcalf (drums) ; Ken Osborne (lead guitar) ; and Simon Spratley (keyboards). They are sometimes complemented by harmonica solos from Adam Russell when he is available. 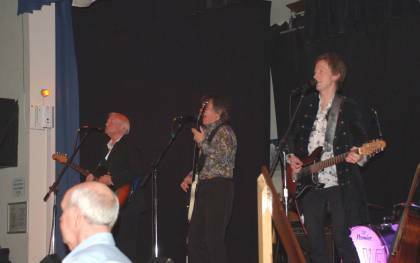 THE JACKIE LYNTON BAND Rock'n'Roll at its very best, with a decent helping of R&B and Blues. 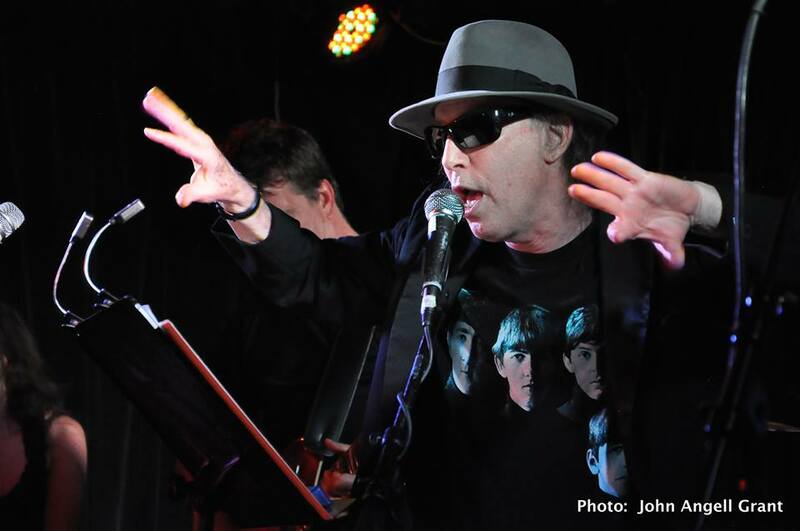 Jack is the ultimate "musician's musician" - his career has spanned the decades, starting as a solo singer in the late fifties and early sixties (Teddy Bears Picnic, Over the Rainbow), followed by a spell in the USA fronting The Savoy Brown Blues Band (Jack The Toad). A prolific song writer, Jack teamed up with masters like Chas & Dave and Rick Parfitt with whom he penned some of Status Quo's best known numbers. He also played with John Coghlan's Diesel and now fronts his own band. Jack is not only a great singer, an eloquent poet and awesome songwriter, but also a terrific entertainer - even his blue jokes sound innocent ! 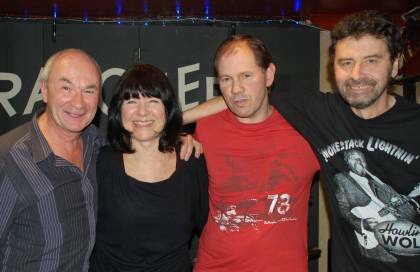 THE FRAN MCGILLIVRAY BAND is one of my favourite bands comprising Fran McGillivray (bass and lead vocals); Mike Burke (Guitar and second vocals); and Roger Nunn (drums and djembe). Their music is primarily blues with some heavy touches of funk/jazz and sometimes an overlay of good old fashioned rock'n'roll - a large proportion of their music is self composed, and all is very beautifully presented. I never tire of watching this band. Fran and Mike also appear as a duo around the folk/blues circuit. Contact Rock Artist Management direct, or Bandmaster@Nashville-Teens.com can put you in touch with them. 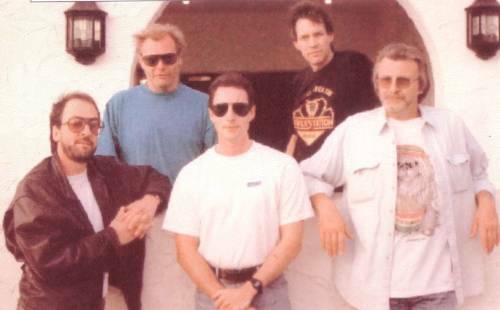 THE SWINGING BLUE JEANS Originally founded by Ray Ennis and the late Les Brand, this band has performed continuously since the early sixties. 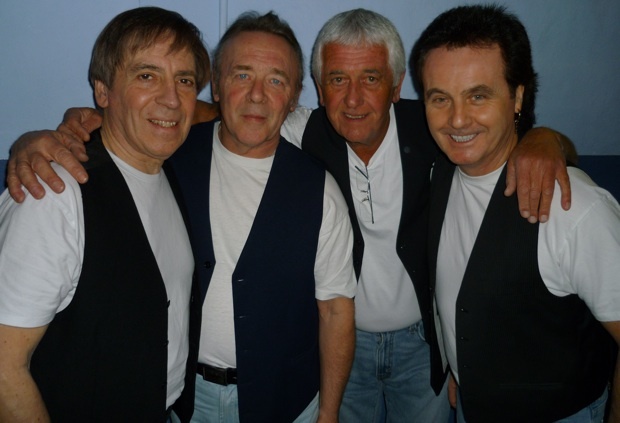 Ray retired in 2010 and the current band is led by Alan Lovell (lead guitar & vocals). He is supported by Peter Oakman (bass guitar) who has an exceptional career with both Joe Brown & The Bruvvers and with Lonnie Donegan - and who penned Lonnie's famous hit "A Picture Of You", a number one in 1962. 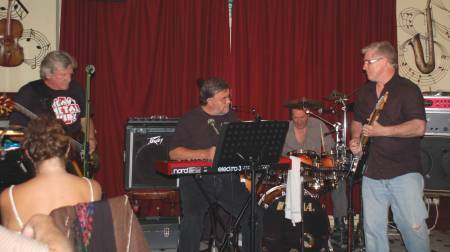 Graham Hollingworth (drums) and Jeff Bannister (keyboards) make up the rest of this marvellously talented group. Don't book them through IfTheDevil, but Bandmaster@Nashville-Teens.com can put you in touch with them. VANITY FARE If you only know this band through their sixties hit "Hitchin' a Ride"; then you have not experienced how versatile they are both in their own right and as session musicians. 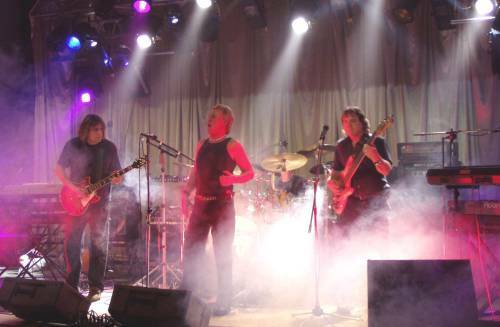 The band comprises original members Bernie Hagley (bass); Eddie Wheeler (guitar); Mark Ellen (Drums); complemented by Steve Oakman on keyboards. Steve is the talented son of Peter Oakman - who originally played with Joe Brown & The Bruvvers, and is now with The Swinging Blue Jeans. The members of Vanity Fare are all superb musicians and all are adept vocalists. They play a variety of styles and enjoy appearing "with guests" - for each of which they adopt the appropriate musical genre. Thus with Ray Phillips they will be an Old School R&B backing band; for Chris Farlowe they will be a blues band, and for Lonnie Donegan Junior they will be a skiffle group. They also maintain their own very special Vanity Fare persona - a psychedelic sixties band - A great value entertainment. THE KEITH ALLEN BAND Keith Allen started his musical career as a member of "Graphite" - the first ever opening act at the first ever Glastonbury Festival ! Keith sings and plays harmonica and rhythm guitar; Simon Spratley keyboards (The Nashville Teens) ;Gordon Vaughan on Lead Guitar; George Lesley Calvert, bass guitar (Alexis Korner, Mike Coopers Machine Gun Co, Jona Louis, King Earl Boogie Band); and Adam Perry on drums; all rounded off by the subtle touch of Drew Taylor (Fable of The Bees) on electric violin. THE ELLIOT SCHNEIDER BAND are an "American Rock" band operating from San Francisco - but when they are visiting the UK Roger handles their logistics. Elliot Schneider is the vocalist who developed his talents as part of the USA's punk revolution (a little better behaved than their UK compatriots) and with his bands, The Pips and The Banned, he supported such giants as Blondie in New York. After "retiring" to a a private life as a teacher, moving to California and subsequently surviving cancer, Elliot is now back on the scene writing avidly and performing enthusiastically. His musical style is strongly influenced by The Beatles. with overtones of Chuck Berry and The Incredible String Band (yes - eclectic!) He is accompanied by his soul partner, Carmen Castro, who plays keyboards. They last toured the UK in 2013. Elliot and Carmen also present a weekly music show on internet CHESTNUT RADIO. Which currently airs on Fridays in West Coast USA, Saturdays on the East Coast and 7pm UK time Monday evenings in the UK and Europe. Elliot always plays some of his own music on his show - a good place to listen in if you want to sample his music. Elliot and Carmen do not have a website, but they each operate FaceBook pages. For listeners in the UK, Roger can supply some of their CDs - contact Bandmaster@Nashville-Teens.com for details. DAVE'S NOT HERE are a consortium of musicians with a taste for Old School R&B and classic rock - all tempered by a good dose of Heavy Metal ! If you like Clapton or The Eagles, you'll love this band. The vocals are shared, but primarily are led by bass guitarist Karl Green (a founder member of Hermans Hermits). 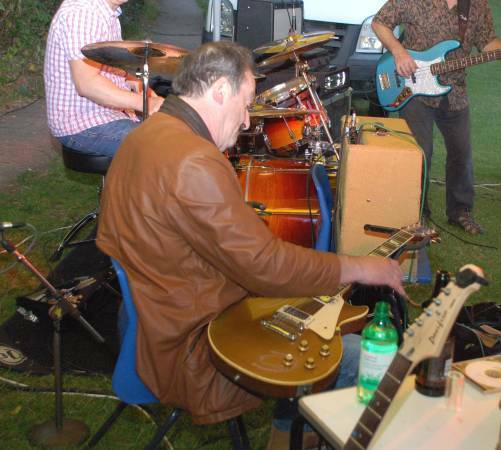 He is ably supported by Richard Scarfe (Love Affair) on lead guitar and occasional vocals. Kevin Welling also provides some vocals as well as delivering keyboard and sometimes a second lead guitar. The drums - and some occasional vocals - are delivered solidly by Ian Saunders. PARIS MOON - comprising Jackie Doe on accordion and Sarah Luton on double bass - the ideal accompaniment to good food, good wine and good company. Alternatively they are available as TANGO SELECT with the added verve of Keith Allen (The Keith Allen Band) on acoustic guitar who can provide a wide range of sophisticated music for parties, weddings or any other occasion you can think of. 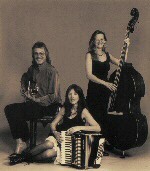 TANGO SELECT BAND is a further development into a four piece, achieved by adding a violin or clarinet to the mix. Don't book them through IfTheDevil - go direct to Live Accordion Music. 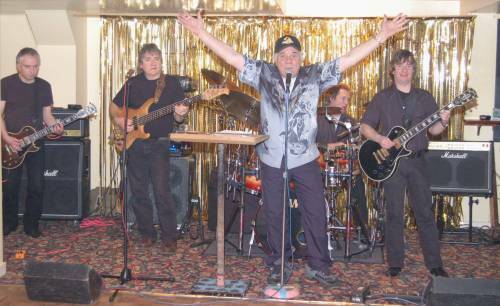 THE KING EARL BOOGIE BAND were a direct descendant of Mungo Jerry - created by Paul King and Colin Earl when they split from Ray Dorsets band. After a long career with many personnel changes, Paul King moved out of the area and eventually Colin Earl wound up the band. Paul still plays regularly - see above - but the "KEBB" are now dormant.